The film from Lucas (an ex-USC film student and intern at Warner Bros.) was almost not made when every studio in Hollywood refused it, except for Universal. With its great financial success, 28 year-old Lucas joined the ranks of a new breed of directors, including Steven Spielberg and Francis Ford Coppola. It was his second feature film, following THX 1138 (1971). The film was Lucas' homage to the memories of his own teenage years in Modesto, California, remembered with vintage cars and dragsters, drive-ins (Mel's), an almost non-stop rock soundtrack, teenage activities (hot rod crusin' and makin' out), and characteristic hair and clothing styles. 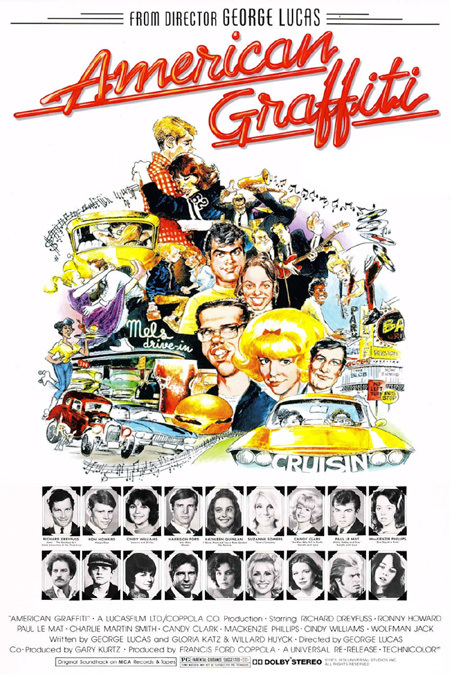 Creating a demand for other popular teen-oriented films, a less successful sequel was also produced - director Bill W. L. Norton's More American Graffiti (1979) that covered the years 1964-67. Director Francis Ford Coppola, following his recent success with The Godfather (1972), joined Lucas in the effort as the film's producer. The film's screenplay was co-authored by Lucas with a USC friend Willard Huyck and his wife Gloria Katz. Because of its financial success (about $55 million in its first release), Lucas was able to carry out his next project - the production of the monumental film Star Wars (1977). While cruisin' and hanging out at the local watering hole (Mel's Drive-In), the four weave in and out of each other's lives as they are on the brink of major decisions (about attending college or finding a job) and suffering from various traumas. Two of the high-school grads, Steve (Ron Howard) and Curt (Richard Dreyfuss) were about to head off the college. The film is seamlessly laced with a classic rock-n-roll soundtrack composed of over forty hits (often emanating from cruising car radios, or the school dance's record player). They frequently function as background music to define the emotions, dreams and frustrations of the group, ranging over almost a decade (from 1955-1962). Many of the songs are served up by legendary outlaw disk jockey Wolfman Jack who appears on the radio and as himself. Other later youth-oriented films imitated this film's use of a pop soundtrack. Most people remember the film as the one with early acting appearances for unknown but up-and-coming actors, such as Richard Dreyfuss, Cindy Williams, Ron Howard (best known as child actor Opie on TV's The Andy Griffith Show, and currently a film director), Harrison Ford, Paul Le Mat, Candy Clark, Charles Martin Smith, Mackenzie Phillips, Kathleen Quinlan, Suzanne Somers, Debralee Scott, Joe Spano, and Bo Hopkins. Many of these stars went on to further film and television careers, appearing in hit TV sitcoms such as Happy Days, Laverne and Shirley, One Day at a Time, Three's Company, Mary Hartman, Mary Hartman, and Hill Street Blues, or films such as The Lords of Flatbush (1974), The Conversation (1974), The Man Who Fell to Earth (1976), The Goodbye Girl (1977), Star Wars (1977), Melvin and Howard (1980), and Apollo 13 (1995). Although the film was nominated for five Academy Awards including Best Picture, Best Supporting Actress (for 26 year old Candy Clark), Best Director, Best Original Screenplay, and Best Film Editing, it came away empty-handed. The film's talented, Oscar-winning cinematographer Haskell Wexler, credited as the film's "visual consultant," was un-nominated. The trailer for the PG-rated film begins with the opening of a 1962 high school yearbook, accompanied by the voice of Wolfman Jack announcing: "American Graffiti. Where were you in '62?" and a view of a typical early 60s gym dance, with a live band playing "At the Hop." An announcer entices: "Grab that special one and jump into your candy-colored custom or your screamin' machine, cruise downtown, and catch American Graffiti." Various quick highlights of the film are covered in a montage during a review of the major characters, that are each presented with a cartoonish picture from the yearbook. A drawing of a wolf-headed student, Wolfman Jack, is described as "Finger Popping" from the class of '51. The voice-over of the narrator concludes: "It's one of those great old movies about romance, racin', and rock 'n' roll." (19 year old Ron Howard) a conservative, clean-cut, short-sleeved, All-American type, university-bound high-school graduate who was Class President, and interested in English. (26 year old Richard Dreyfuss in his first film) another recent graduate interested in Science - an intelligent, plaid-shirted character. Curt is the recipient of the first scholarship, two thousand dollars, ever given out by the Moose Lodge to the top student. Restless and uncertain about leaving for college. (26 year old Cindy Williams) Curt's slightly-younger sister and Steve's pretty, steady girlfriend with a short-bobbed hairdo. Another rising senior and the Head Cheer Leader, she wears Steve's oversized letterman sweater. You chicken fink...After all we went through to get accepted? We're finally getting out of this turkey town and now you want to crawl back into your cell - right? You wanna end up like John? You just can't stay seventeen forever. Another older character pulls up in a yellow, '32 Ford deuce coupe - John Milner '60 (21 year old Paul Le Mat), who has been out of high school since two years earlier and is an auto mechanic. He is a going-nowhere "Marlon Brando" type and an acknowledged, undisputed drag-racing idol - a James Dean-wannabe. Curt: Why is it every girl that comes around here is ugly? Or has a boyfriend? Where is the dazzling beauty I've been searching for all my life? John: I know what you mean. The pickin's are really gettin' slim. The whole strip is shrinking. Ah, you know, I remember about five years ago, take you a couple of hours and a tank full of gas just to make one circuit. It was really somethin'. After being served in their car, Steve and Laurie have an "adult" conversation about the future prospects for their relationship. He suggests having the freedom to date others and sleep around while away at college: "Maybe, before I leave, we could, ah, agree that, that seeing other people while I'm away can't possibly hurt, you know?...I think it would strengthen our relationship. Then we'd know for sure that we're really in love. Not that there's any doubt." Unexpectedly agreeing with him but devastated by the suggestion, Laurie removes the chain around her neck holding his class ring: "I can't expect you to be a monk or something while you're away." Curt stands by Steve's Chevy and speaks to his sister, now traumatized and struggling to hold back her emotions about her boyfriend's imminent departure. Steve entrusts an awe-struck Terry with his car for safe-keeping until he returns at Christmas time - with only a few instructions: "Only 30 weight Castrol-R...Now I've written the tire pressure and stuff on a pad in the glove..." Overjoyed with tears, Terry blubbers: "I don't know what to say. I'll love and protect this car until death do us part. This is a superfine machine." As a prank, Terry's pants are pulled down from behind by John as he propositions one of the bellhops Budda Macrae (Jana Bellan) for a drive-in movie date in his new wheels. Steve, Laurie, and Curt have plans to go to the Freshman Hop "to remember all of the good times...for old time's sake." John has different objectives for his life - he lives in the present with his sleek hot-rod and he refuses to grow up: "I ain't goin' off to some god-damned fancy college. I'm stayin' right here. Havin' fun as usual." ["Runaway" by Del Shannon.] Everyone cruises in the one-way traffic on the main strip in their fancy automobiles - it is an endless parade of customized cars. Police cruisers are on the lookout from side streets. Couples neck close to each other in the front seats, and two guys squirt water from squirt guns across the gap of two cars pacing each other. An Italian guy named Jeff Pazzuto (Ron Vincent) informs John about a rumored drag challenger in town: "There's a very wicked '55 Chevy lookin' for you." While cruising the main drag in his newly-acquired Chevy vehicle, Terry is razzed by someone leaning out of another car: "Is that you in that beautiful car? Geez, what a waste of machinery." From the car cruising next to him, Terry is mooned by a bare-assed guy in the back seat who presses his cheeks against the car window. Quick! Hang a right...Cut over to G Street. I just saw a vision! I saw a goddess. Come on, you've got to catch up to her....This was the most perfect, dazzling creature I've ever seen...She spoke to me. She spoke to me right through the window. I think she said, 'I love you.' That means nothing to you people? You have no romance, no soul? She - someone wants me. Someone roaming the streets wants me! Will you turn the corner? At a prime girl-watching spot in town next to the strip, John sits slouched in his yellow deuce coupe. When a group of laughing, flirtatious girls shoots by in a Studebaker, he pursues them and pulls alongside and propositions one of the cuties: "How'd you like to ride around with me for a while?" He is refused female companionship from the girl in the front seat (Jody Carlson) because she's going steady, but 'Judy's sister' Carol Morrison '65 (Mackenzie Phillips), a rising sophomore, is volunteered to ride with him. Even so, he persists with the first girl: "You ever get tired of goin' steady with somebody that ain't around - I'm up for grabs." ["That'll Be The Day," by Buddy Holly.] At the light, Carol eagerly jumps from her car to join him. John realizes that he has inadvertently been saddled with a chatterbox, bratty thirteen year-old girl (who wears a T-shirt emblazoned with "Surf Boards by Dewey Weber") - the kid sister of a girl he doesn't even know: "This better be a joke, 'cause I'm not drivin' you around." Unwanted by anyone, Carol considers herself a discarded object: "What's the matter? Am I too ugly? Judy doesn't want me with her and now you don't want me with you. Nobody wants me - even my mother and father hate me. Everybody hates me." Embarrassed, he pushes her head down so that he can't be seen with her. Man: Excuse me, but I think we've had an accident. Terry: Well, goddamnit, I won't report you this time, but next time just watch it, will ya? Terry pulls away, appearing indignant, leaving the man standing puzzled in the middle of the street. (Note the Continuity Error: The man's headlights are on immediately after the crash, and are off when Terry guns away.) He pulls up in front of a used car lot. As he bends down and inspects possible damage to the car's rear fender, a ready-to-deal slick salesman approaches and attempts to sell him one of the sporty 'Vettes on the lot. In the Dewey High School gymnasium where the Freshman "Welcome Back" hop is being held, red-blazered, thin-tied Herby and the Heartbeats (Flash Cadillac and the Continental Kids) sing their rendition of "At the Hop." Blue and white, twisted crepe paper is draped from the center of the gymnasium, and the walls are decorated with pennant awards. Ponytails and mid-calf skirts are gyrating among the mass of stockinged dancers swinging to The Hop. Girls without dance partners sit on the raised wooden bleachers on the sides. In front of the mirror in the girls' lavatory (where some girls are smoking), Laurie is despondent and heartbroken over Steve's departure while she brushes her hair. Her cute cheerleader girlfriend Peggy (Kathleen Quinlan) advises: "You'll forget him in a week. After you're elected senior queen, you'll have so many boys after your bod." In a parallel scene in the boys' lavatory, groups of guys are primping in front of a mirror. With an assured voice of experience, Eddie (Tim Crowley) thinks Steve's decision to "date other people" at college is a good one: "I hear college girls really put out." Someone shouts "Cherry bomb" as one of the toilets explodes and pipes gush water. As the rock group sings a slow number ["She's So Fine," performed by Flash Cadillac and the Continental Kids - and written exclusively for the film], Steve invites Laurie to dance with him: "I thought that since this is our last night together for three months, you might want to dance with me." He is soundly denied as she pushes him away - deeply hurt by his earlier cold suggestion that they date others while he's away: "Get your cooties off me." He grabs her by both arms and she makes a scene: "Go ahead, slug me, scar my face. I wouldn't dance with you if you were the last guy left in this gym." To spite him, Laurie volunteers to dance with Eddie, Peg's boyfriend - Peg cruelly insults Steve for being so emotionally inept: "Joe College strikes out." I think I may find that I'm not the, uh, competitive type myself...well, I'm not really sure that I'm going. As Curt walks back toward the gym, he spots a white T-bird in the parking lot with two people making out in the front seat. But when he is about to speak to them, thinking that he has located his dream girl, he realizes his awkward error in identification. ["Surfin' Safari," by The Beach Boys.] Back on the Main Street, John glides down the drag strip in his '32 Deuce Coupe, hassled when Carol (a "grungy little twerp") takes a pressurized can of shaving cream and squirts foam in his face: "Hey, drivin' is a serious business. I ain't havin' no accidents just because of you." He abruptly turns off the surfin' song on the radio: "I don't like that surfin' s--t. Rock 'n' Roll's been goin' downhill ever since Buddy Holly died." A police car with red bubble aglow stops his car, and as the cop approaches, Carol blackmails him into repeating the phrase: "I was a dirty bird, Carol's not grungy, she's bitchin'." ["The Great Imposter," by The Fleetwoods.] After questioning Milner about his whereabouts at about 8:30 pm (and if he was at the corner of 12th and G), the cop Holstein (Jim Bohan) cites him for a burned-out license plate light and for driving a low-rider ("the front end of this, this thing you're drivin' looks a little low"). John protests that his car's front end is actually at the legal height ("12 and a half inches regulation size"). The cop threatens to pull Milner in and 'catch him in the act'. John asks Carol to file the cop's ticket with other similar ones stuffed into his glove compartment under "C.S." - "Chicken S--t."
What a babe...what a bitchin' babe. I always thought I looked like Sandra Dee. Peel out. I just love it when guys peel out. Nodding, he accommodates her request.